Some small energy companies have strong growth, as well as takeout potential, says Tyler Kocon, manager of the Bakken Shale model, in an exclusive interview. Tyler Kocon just swapped out some well-known names in his investment models, making room for two gas-related stocks he thinks might fare better going forward. 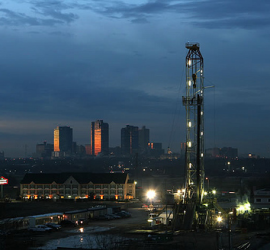 North American Shale Energy portfolio manager Tyler Kocon quoted in Barron’s. Oil prices are again on the rise, and will make their way to $100 a barrel late this summer, says investment manager Tyler Kocon. Tyler Kocon, manager of the Bakken Shale model, is invested in stocks that could benefit whether or not there’s a face-ripping rally in natural gas. The shale energy boom is improving incomes and jobs outlook. A look at the shale boom from the ground up.